In a small bowl, stir the sauce ingredients together and set aside. Grind the chillies and garlic in a small food processor or chopper, adding a little water to help the blades work, if necessary. Peel potatoes and cut into halves lengthwise. Cover with water and boil for 10 – 12 minutes or until tender (but not soft). Drain. Cut tofu into halves and blot carefully with kitchen paper to get rid of excess moisture (this prevent splattering during frying). Heat oil in a wok and fry potatoes until golden brown. Remove and drain on absorbent paper. When cool enough to handle, cut crosswise into 0.5 cm slices. Now fry the tofu in the same oil until golden brown. Drain on absorbent paper and when cool enough to handle, cut into 1 cm slices. Remove all but 3 tbsp of the oil from the wok. Place wok over medium heat and fry the ground chilli and garlic mixture, stirring continuously, until the paste is well cooked. Add the sliced onion, turn up the heat to high and add the tomatoes, potatoes and tofu. Fry for 2 – 3 minutes. Stir in the mustard greens and cabbage and continue frying for a few more minutes. Add noodles and sauce mixture and continue frying until noodles are tender. Push noodles to the edges of the wok to create a “well” in the middle of the pan. Drizzle 2 tsp of oil in this and crack in 2 eggs. Stir them around to scramble them and when the egg starts to set, combine with the noodles. Finally, add the beansprouts, fry on high heat for another 2 or 3 minutes and dish out onto a serving platter. Garnish the top with fried shallots, spring onion and calamansi limes. 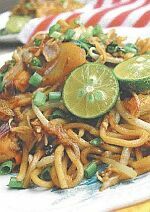 Mee goreng is of course best served hot off the pan, but it will tolerate standing around for a bit and being served at room temperature.